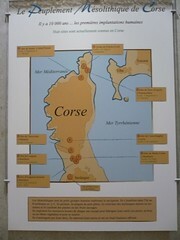 Wednesday was my trip through the heart of Corsica, taking in the Bronze Age sites of Cucuruzzu and Capula: the former rather dull, in all honesty, the latter re-occupied in the Middle Ages by Count Bianco, who ruled the whole of southern Corsica from here, leaving barely any trace of the earlier Bronze Age site save a single statue-menhir now reconstituted and erected at the entrance. 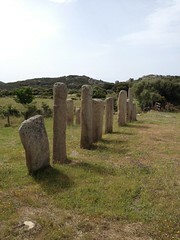 The Prehistoric Museum at Levie was well worth it – a regional museum with artefacts from Cucuruzzu and Capula and other sites around the south of the island, including the Dame de Bonifacio – a 35yr old disabled woman from 10000BCE. 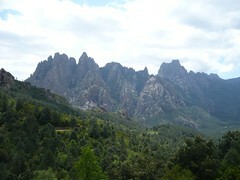 It became really clear here how the islands of Corsica and Sardinia were once one massive lump of granite – originally part of the Pyrenees – which had moved gradually across the western Mediterranean only reaching its current location as recently at 9500BCE – a blink of an eye in geological time. 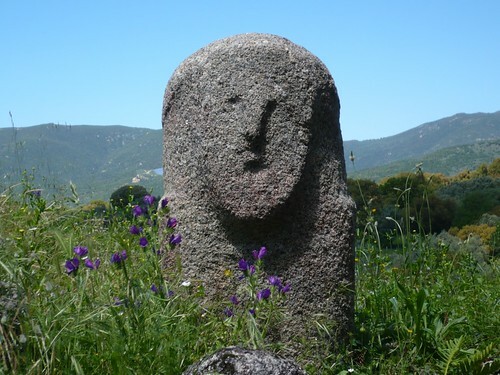 To repeat from the last post, not only all the obsidian found on Corsica came from Sardinia, where the main obsidian mine for much of Europe is found; there aren’t any metal ores on Corsica either, so all the bronze – all the swords and daggers on the statue-menhirs – came from Sardinia, too. From Levie the drive up through Zonza takes you past the Col de Bavella, the immense peak of the southern part of the island, like a punk haircut in ancient stone, riven by the ravages of time and erosion into the weirdest of shapes: the ‘Quarry’ at Filitosa but on an epic scale! The drive down the east of the island from there gives continuous glimpses of the most lovely of beaches, before the road turns inland again toward Porto Vecchio. Wishing to avoid this most touristy of towns, I climbed up to the mountaintop of Casteddu d’Araghju (quite a climb in the afternoon heat, I can tell you) to the Bronze Age Nuraghic-like ruins there, before heading back across country to Sartene, through the smaller villages back up to Levie and back down the winding road to my little gite. Thursday, like Tuesday, was a quieter day for relaxation, but I did take in the lovely seaside town of Bonifacio in the early evening, stopping at the delightful Terrasses d’Aragon restaurant, where the food was every bit as good as the view, (despite the complaints of fussy eaters on Trip Advisor) and I was able to marvel at the short strait that divides Corsica and Sardinia – perhaps a teensy bit wider than the Menai Straits, and certainly too wide for a bridge, but much much closer than France is to Britain, which of course was also a walkable landmass at the same time, when mesolithic hunters peopled Europe. 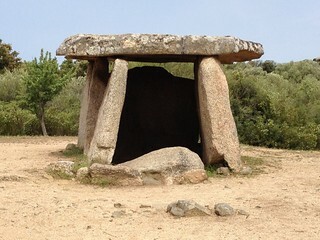 Today – Friday – I have seen the megalithic site that makes the holiday, for me. 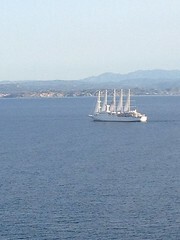 Filitosa, as my last post I think made clear, was far too ‘interpreted’ for me. 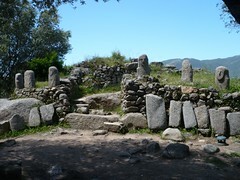 Today, after visiting the small alignment of Stantari, the slightly larger grouping/alignment of Renaghju, and the ‘poster boy’ dolmen of Corsica: Fontanaccia, all thankfully left fairly well alone, (albeit along a well signed, well fenced tourist walk), I struggled across fields up and down a long and winding dirt path with no signage – unsure I was even going the right way, though trusting the excitement in my heart – to the barely touched, mostly recumbent, weed strangled Alignements de Pagliaju. 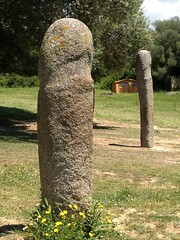 Stantari had (at least) two of the later, Bronze Age (c2000BCE here) statue-menhirs, with their proud phallic heads and stony faced looks, standing slightly taller and narrower than their rough hewn neighbours. This made me think, strangely, of the Celtic Crosses in the Hebrides, which I had always thought were probably remodelled standing stones, the new religion recycling the monuments of the old. 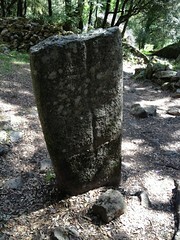 Here it was again – though in this case c3000BCE monuments remodelled in c2000-1800BCE. 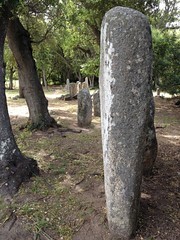 There seems some disagreement on the web about whether all of the menhirs in this particular alignment are statue-menhirs or just the two. 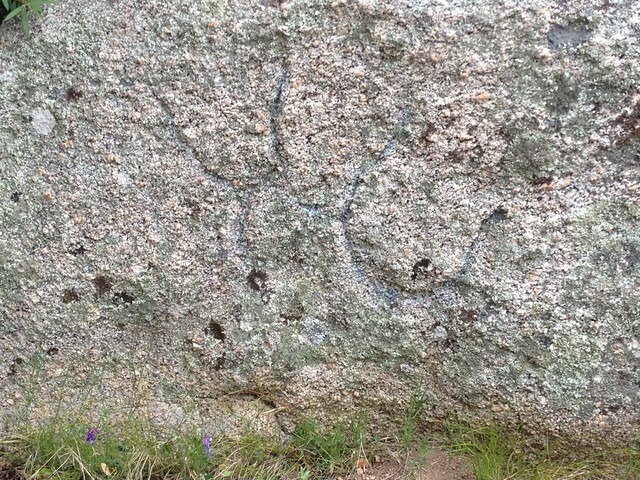 To my eye, there were only the two, amongst rough-hewn others. But as the whole site was fenced off with barbed wire it was impossible to get close enough to really tell. 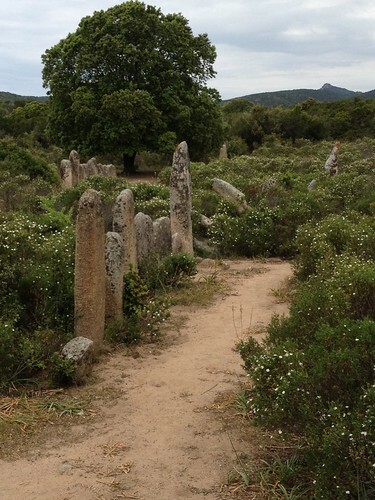 Renaghju, not fenced off, about 5mins walk down the path, was definitely all rough hewn – supporting my feeling that the statue-menhirs were later remodellings at Stantari. 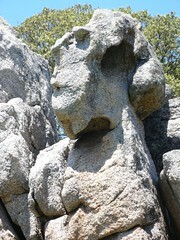 There seemed to be a number of alignments with nearby hilltops, in particular with the characteristic Corsican rocky outcrops shaped by erosion into weird and wonderful and eerie faces, animals, and rock-spirits. 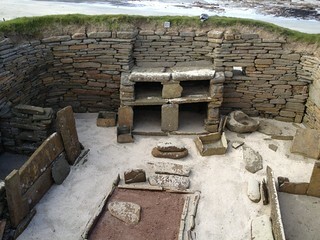 The alignments were however either very complex or the re-erection of stones quite haphazard. But then finally, some 20mins or so further down the road, and situated on private land, with just a short little drive off the main road, blocked off with granite blocks, leaving parking space for only one car between the main road and the blocks, all under a rusting and defaced sign saying ‘Palaggiu’, I began the 15minute walk up into the wilderness, past an empty ruined hilltop farmhouse, with only the odd collection of rocks shaped into an arrow to guide my path (very tasteful I thought), leading finally to a completely rusted sign with an arrow scratched onto it pointing off the main track to what I had gleaned from the map was the site of the Alignements de Pagliaju. The atmosphere here was truly amazing. The stones fair sizzled in the midday heat (as I did!) and for all that many of them were recumbent, those that still stood made clear how the original site seemed to have been laid out. I could discern something of a ‘T’ shape, with the top bar longer than the pillar, if you get me. 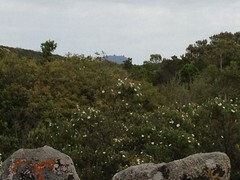 The pillar seemed aligned with the very far distant peak of the Col de Bavella. 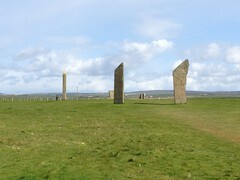 There were so many stones in the central main alignment – I would guess originally a double row of stones, similar to that at Callanish – but as most were fallen, tumbled amongst the gorse and weeds, it was difficult to tell if there weren’t here and there single or small groups of stones between the rows, too. 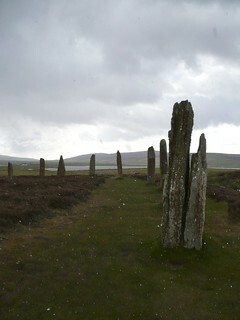 The stones in the ‘pillar’ of the ‘T’ were so tumbled, all recumbent in the dust, it was not possible from a short visit such as this to tell if they had even been in a row, though they certainly seemed to extend away from the main lines of stones in a perpendicular direction, roughly in line with the far distant mountain tops. Over to one end was a group of massive granite blocks (such a frequent sight here) which I could climb to get something of an overview. 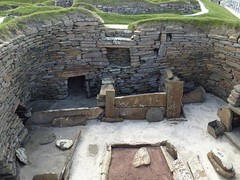 Behind the blocks, seemingly at the entrance to the site, were the remains of a cairn, I don’t know whether contemporary or later than the alignments, that seemed to include internal cup-and-ring marks. I spent over an hour here, in the baking heat, wandering amongst these enigmatic stones, thankful to the owner for leaving well alone and making it quite hard to reach, alone with the ancients.